Skippy Dies is a difficult book to categorise. It's a boarding school novel, it's a comedy, it's a tragedy, it's a reflection on the ways in which all lives and all stories intersect and affect each other. Paul Murray's second novel revolves around the Seabrook College for Boys in Dublin. There's a large cast of characters, including Daniel 'Skippy' Juster, his friend & room-mate Ruprecht Van Doren, their History teacher Howard 'The Coward' Fallon, object of Skippy's affection Lori (from the girls' school next door) & school bully/drug-dealer Carl. There are more, of course, in this well-populated novel, but those are the ones whose perspective we see the most. 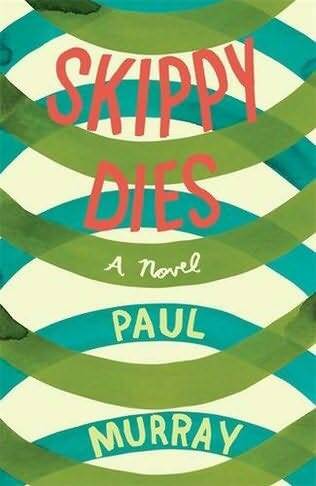 Anyway, a novel called Skippy Dies features a lead character called Skippy, so there's at least one thing you know going in. Murray takes care of that by having the death scene as a prologue to the rest of the book, and then steps back in time to how & why we got there. Skippy and Ruprechet are unusual students - the latter in particular, an enormously fat genius interested in string theory and the idea that our dimension is merely one of eleven. The pair of them, and their larger circle of friends, spend most of the first two-thirds of the book worrying about the sorts of things all teenage boys do: school, girls, parents, theoretical physics. Skippy is fascinated with Lori, who is in turn attracted to the dangerous (& probably psychopathic) Carl. Murray makes this theme not just his character's philosophy, but also the structure of the book as a whole. By switching between the different characters every few pages, we gain a better understanding of each of them - a gradual reveal of not just plot & character, but also some larger points about history and people's lives. Skippy Dies is an intriguing book. It's fairly long (660 pages in paperback), but moves quickly throughout. The changing character POV is an effective technique not just for the reason I've just discussed, but also in terms of pacing - by constantly cutting between characters, we're always tempted to read just a little bit more to see whose chapter comes up next. Murray has a fine ear for dialogue, particularly that of his teenage characters, and maintains a light touch even in the book's tragic sections (of which there are several). The Booker Prize has not traditionally had much time for 'comic' novels, and I do wonder whether an ostensibly comic novel set in a school is a likely winner. I do hope (at this point in my reading, anyway!) that Skippy Dies makes it through to the shortlist at least, since I think it's worthy of a wide audience. Even if it goes no further, I'm glad I had it brought to my attention. Next up: David Mitchell's The Thousand Autumns of Jacob de Zoet.